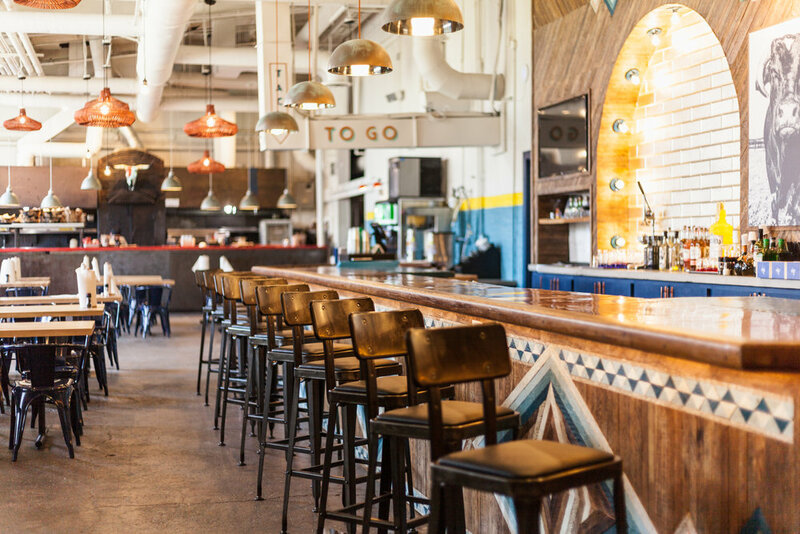 Repurposing an existing restaurant space into a fast-casual taqueria concept for Mojo’s Tacos brought a fun and creative challenge. The surrounding complex — the aptly name, circa-1929 Factory at Franklin — was repurposed into a mixed-use development in the 1990s, with a focus on maintaining original architectural details: lots of heavy steel beams, worn brick and other strong industrial textures. To honor the building’s history but inject fun and energy for a fresh, innovative taco concept, pops of color and texture were brought in to play with the industrial backdrop, from bright bands of yellow and turquoise to copper patina chandeliers from local lighting fabricator Southern Lights Electric, and a custom cactus wallpaper mural for photo ops and unique twisted copper wire pendants that welcome guests at the entrance.